Alex writes: One of the things I’m expecting to need to decide soon is what kind of flat-screen TV to get—we’re still watching things on a ‘fishbowl’ CRT from the Dark Ages. What’s the trends if we want something basic? What’s the minimum buy-in these days? Hi Alex! You’re not the only one who still has a “tube” TV in their living room—and you’re not alone when it comes to wading into the tricky, jargon-ridden world of HDTVs. Yep, it’s confusing—hence, my cheat sheet for first-time HDTV buyers. Read on for part one, and click here for part two. The sky’s the limit when it comes to HDTV price tags, of course. But what’s a reasonable price tag for a solid, garden-variety HDTV set? Well, that depends on how big you want to go. If you’d rather get your feet wet with a smaller set—say, 32 inches or less—expect to drop anywhere between $300 and $400 for a quality set. Spending much more would be overkill for a mid-size or smaller HDTV; go cheaper, though, and you might end up with a lemon. Want a set that’s 40 inches or larger? Then expect to pay more—and potentially a lot more, depending on the optional extras. As a baseline, though, a decent 40-inch HDTV will run you about $600, with prices ballooning to $1,000 and up once you hit the 46- or 50-inch mark. What brand should I get? The top TV brands include names like LG, Mitsubishi, Panasonic, Samsung, Sony, and Toshiba. Personally, I’ve always been a Sony person, but Panasonic has won raves for its plasma HDTVs (more on plasma versus LCD in a moment), while Samsung is also up there in the top rung. As for the cheapest brands that you’ve never heard of, remember: you get what you pay for. One of the oldest questions HDTV questions around, and still a good one. Plasma HDTVs tend to give you the most vivid colors and the best contrast ratios—that is, the greatest range between the brightest and darkest spots in a given image, a key factor when it comes to the best-looking picture. But Plasma TVs are expensive compared to their LCD counterparts, and they are prone to “burn-in”—a problem where static images (like TV news tickers) that stay on the screen too long end up becoming permanent, ghostly fixtures. That’s the bad news; the good news is that the latest plasma sets are far less susceptible to burn-in than earlier-generation plasma HDTVs. Bottom line? Plasma HDTVs look great, but cost more. LCD sets might lack the “pop” of plasma (although the priciest LCD HDTVs look spectacular), but tend to be cheaper. Wait, there’s a third type of HDTV? Well, not quite. So-called “LED” TVs are, in fact, LCD sets that use LED backlighting rather than older CCFL (or “cold cathode”) technology used on standard LCD HDTVs. So, what’s so great about LED backlighting? Three main things: better picture contrast, less power consumption (and lower power bills! ), and (potentially) a thinner TV set. What’s the downside? 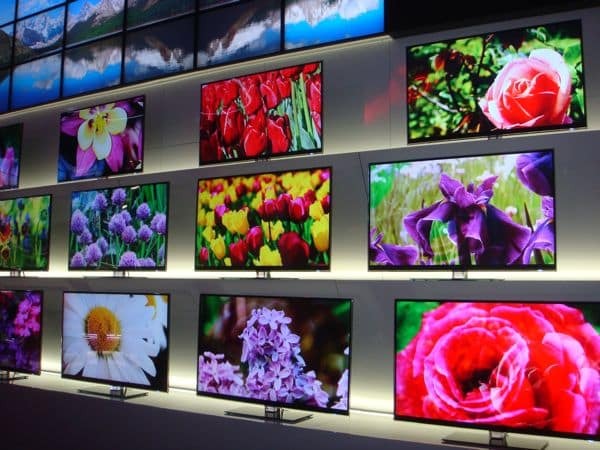 You gussed it: price, with LED-backlit TVs often costing hundreds of dollars more than the same-size LCD sets. All this “p” stuff has to do with picture resolution—specifically, the number of itty-bitty “pixels” that a given HDTV set can display. The highest quality for today’s consumer HDTVs is 1080p: 1,920 pixels wide and 1,080 pixels from top to bottom, for a total of more than two million pixels, the same resolution as a Blu-ray disc player. Then you have 720p: 1,280 pixels by 720, for a total of about 920,000 pixels—or less than half the resolution of a 1080p set, although 720p is still considered sharp enough to qualify as an HD-quality picture. So, which should you get? Well, you’ll need a 1080p HDTV to see every last detail on a Blu-ray movie—but you’ll pay more for the privilege. Also, consider this: most home-video experts agree that the human eye can’t tell the difference between 1080p and 720p on a TV screen smaller than 40 inches—meaning that getting a 1080p-quality 32-inch HDTV might be a waste of pixels, not to mention money. My advice? If you want an HDTV that’s 40 inches or larger, go with 1080p. Smaller than 40 inches? Then 720 is fine. Bonus tip: The “p” in 1080p stands for “progressive,” meaning a TV image in which every frame is drawn in a single pass, from top to bottom, for a smoother and more film-like image—as opposed to an “interlaced” image that’s drawn in two interlaced passes, resulting in a fuzzier, more jagged-looking image. That’s it for part one of my HDTV cheat sheet; click here for part two, which includes advice about TVs with Internet widgets, 3D, and more!